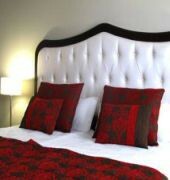 The Kenton Palace offers rooms with free Wi-Fi and plasma TV in traditional San Telmo District. Buenos Aires Main Square is 300 metres away. It is decorated with parquet floors and warm-coloured bedspreads, rooms at Kenton Palace are fitted with air conditioning and heating. All of them have private bathrooms with toiletries. A buffet breakfast is served daily. International dishes and pizza specialties can be ordered at the restaurant, as well as a wide variety of wines from the properties cellar. The drinks and snacks can be enjoyed at the bar.Guests can use the steam room and the massage room for an extra fee. The fitness centre is also available for an extra fee. Argentinas Government House is 300 metres away. The Kenton Palace Buenos Aires is 200 metres from Plaza de Mayo metro station and 35 km from Ezeiza International Airport.